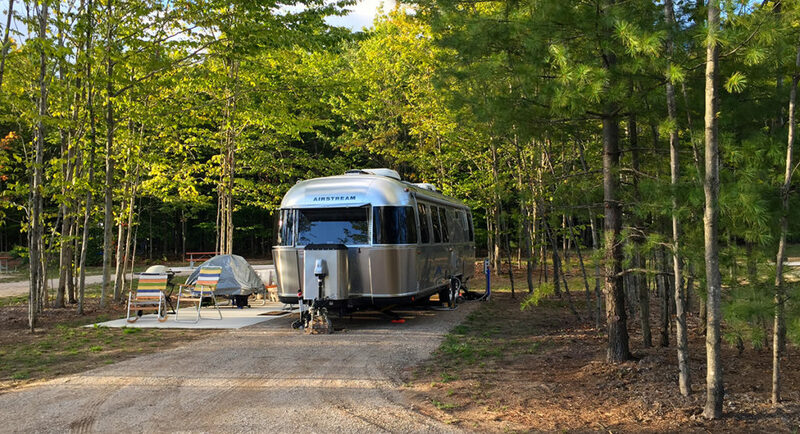 Located along M-72 the Indigo Bluffs RV Park & Resort has spacious RV sites, separate peaceful camping sites and beautiful cottage rentals in a place where natural beauty surrounds you. Whether you’re looking for an enjoyable weekend, a family vacation, or planning your entire season, this is the place to stay. Steps away from the Sleeping Bear Dunes, beaches, hiking/biking trails with Traverse City just 20 minutes away. Enjoy spacious sites in a traditional Up North setting under a canopy of maple trees. Accommodating all towables, Pop-ups and Motorhomes with Water+Electric, Full Hook-Up and Pull-Thru sites. Rustic Cabins and Tent sites also offered. Surround yourselves in natural luxury; our mature trees, rolling topography, and blend of wildflowers and turf delivers a high-end RV lifestyle experience. Private entrance and paved roads lead to all sites offering 50A, Full hook-ups, and 16ft x 65ft stamped concrete pads and adjoining patios. Combine the comforts of home with an authentic camping setting. Two spacious floor plans to choose from: two queens, open kitchen/living area, walk-in shower, huge covered porch, fire pit and outdoor seating. Heated Pool, Resort-wide WiFi, Laundry, Bath Houses, Store, Pavilion, Playground and more.